Pravda’s “Faith” section features a “difference of opinion” on Pope Ratzi today. On the one hand there’s Thomas J. Reese. “Refreshing” isn’t a word I’d use to describe this former Hitler Youth. But Reese is just getting started. Most recently, he wrote a letter to all the bishops in the world to explain the lifting of the excommunication of the four bishops of the Society of St. Pius X who were illegitimately ordained by Archbishop Lefebvre in 1988. He acknowledges that his decision “caused, both within and beyond the Catholic Church, a discussion more heated than any we have seen for a long time.” Even “many bishops felt perplexed” by the decision, he wrote. He acknowledges that the lifting of the excommunication of Bishop Richard Williamson appeared as “as the repudiation of reconciliation between Christians and Jews, and thus as the reversal of what the [Second Vatican] Council had laid down in this regard to guide the Church’s path.” This was not his intention. Oh yeah we all buy that one. A Hitler Youth wouldn’t keep up on the voluminous press coverage of holocaust-deniers worldwide. If that’s your story you stick to it, dear. But it won’t fool anyone with half a brain. “”Another mistake,” acknowledged by the pope, “which I deeply regret,” was that the lifting of the excommunication was “not clearly and adequately explained at the moment of its publication.” He attempts to explain that an excommunication is a punishment aimed at “calling those thus punished to repent and to return to unity.” After 20 years, that has obviously failed, so he was willing to try something else after the bishops “had expressed their recognition in principle of the Pope and his authority as Pastor, albeit with some reservations in the area of obedience to his doctrinal authority and to the authority of the council.” He then explains that excommunication has to do with ecclesiastical discipline not doctrine, and that it applies to individuals not institutions. Whether anyone except canon lawyers can understand these legitimate but technical distinctions is an open question. But the bottom line is clear: “until the doctrinal questions are clarified, the Society has no canonical status in the Church, and its ministers – even though they have been freed of the ecclesiastical penalty – do not legitimately exercise any ministry in the Church.” Such as clear statement could have avoided false headlines using words like “welcomes back,” “embraces,” “rehabilitates,” etc. IOW, it’s a PR problem. Isn’t that obvious? “I agree with the pope’s analysis of the Williamson crisis. The decision making process was flawed and the roll out of the decision was a disaster. As I said earlier, lifting the excommunication was a prudential decision which the pope had every right to make and it did not mean an endorsement of the views of Williamson or of the Society of St. Pius X. Hey, you forgot the gays! But then again, maybe you didn’t. You remembered not to mention them. Oh there’s more than just headlines at stake here, as Robert S. McElvaine notes in his dissent. Amid all the justified outrage we all feel at Bernie Madoff and the AIG bandits, let us save some intense outrage for Pope Benedict XVI. “There are, of course, no provisions in the hierarchical institution set up, not by Jesus but by men who hijacked his name and in many cases perverted his teachings, for impeaching a pope and removing him from office. But there ought to be. As I detail in my latest book, “Grand Theft Jesus: The Hijacking of Religion in America” (Crown), the cardinal sin of the Catholic Church — a literally deadly sin, if ever there was one — is its opposition to birth control. Far from being, as the Church contends, part of its moral doctrine, this policy is, plainly, the immoral doctrine of the Church. The use of condoms is a pro-life position. Well that’s a very important sin, but there are others. One in particular. Are you up to dealing with it? “Misogyny may not be “the Church’s one foundation,” but it is a major part of the base on which it was constructed. It should be obvious that the sin in an over-populated world is not attempting to control birth, but attempting to control birth control. And now for the pope to go so far as to indicate that condom use worsens the spread of AIDS — there’s an outrage that tops Madoff and AIG! 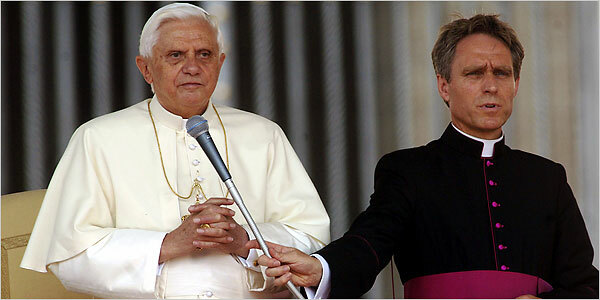 Let’s start a movement within the Catholic Church to impeach Pope Benedict XVI and remove him from office. While we’re at it, let’s replace him with a woman. He reversed the excommunication of a Holocaust denier. Will he excommunicate me for pointing out that he is a misogyny denier? Well apparently not, so — HERE! or the boytoy ensconsed within. And he has, despite all the bleatings of his apologusts, no regrets. So take it away Captain Jack!